This entry was posted in canada immigration Visa and tagged Canada PR Canada PR card Canada PR Visa Permanent Resident Visa in Canada on February 8, 2018 by Blog Author. Permanent Resident Visa in Canada: Canada has a charm and is considered as a beautiful and magnificent country. Many tourists, workers, students, and businessmen, visit it daily. These Visitors have different ambitions, and future goals to deal with. The policies of the Government are favorable. It is a land of diversity and is also ideal for studying and working. It has a visionary leadership making it more suitable for different people to meet their aspirations. Canada is blessed with a strong economy and is considered as an advanced nation. Canada is known for having a soft immigration policy and is a perfect setting for families to live. It is an ideal country to acquire a permanent residency and has a high employment rate. Many immigration programs meant for talented and skilled workers apart from foreign professionals are available to get permanent residency. We consider them here. The Permanent Resident card serves as a proof and identifies the person as a permanent resident of Canada when he/she is traveling outside the country. In order to re-enter in Canada, this PR card is needed. The card holders can study, work and live in any region of Canada. They can apply for citizenship in Canada. They can avail social benefits similar to other Canadian citizens including health care. They gain protection in the Canadian Charter of Rights and Freedoms, and Canadian Laws. Other required documents based on visa categories. PR as a Skilled Immigrant: the applicant gets selected as per the Education received; age, Skills in English or French Language, and Work Experience gained. The application must be submitted through Federal Express Entry System. The candidates are chosen on parameters of Education, Age, Language abilities, Experience, and Adaptability. Two stages of application are involved in PNP: At first, Apply to the PNP where the applicant resides. As per the requirements of the immigration system and the plan to live there an appropriate decision is made. 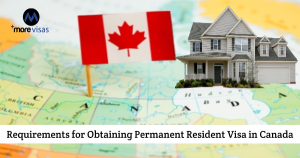 By Submitting an Application to IRCC, and seeking permanent residence, after obtaining nomination certificate, from the territory. It will be reviewed as per the relevant rules of Canada. QSWP (an Investor/Entrepreneur Program) Immigrants are selected based on the skill requirements of the economy and the prevalent conditions of the labor market. With these requirements and the knowledge of the expectations, the applicants can file their claim, to gain a Permanent Residence Visa in Canada.